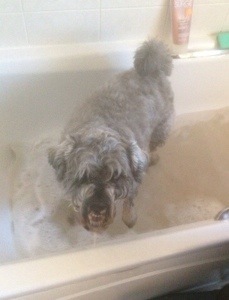 Little Bear hates having a bath. He’s not unusual as I suspect most dogs dislike our penchant for making them sit in warm water while shampooing away all those delightful doggie aromas: mud, stinky puddle water, poop (LB loves the fox variety but will settle for cow pats at a push) and his particular favourite, dead stuff. The day he rolled in a long dead rat is still chillingly fresh in my memory as is the sight of him swaggering home, proud as punch not realising that six baths would be necessary to rid him of the stench. Little Bear is now six so I’d sort of resigned myself to the fact that bath time would always be a necessary evil where he turned on the puppy dog eyes with the occasional shiver for good measure and I ended up feeling guilty. As a big fan of positive reinforcement I’ve tried using toys and treats over the years but he largely ignored the toys and took the treats with a reproachful ‘this isn’t working you know’ glare. So imagine my surprise when yesterday, LB jumped into the bath on his own! We’d been out for a long forest walk and he was really muddy. But as he’d only had a bath last week I decided to let the mud dry and brush it out. Bear though had other ideas. While I was hanging up the towels in the bathroom he trotted in, rested his nose on the bath and wagged. Then came the cute over the shoulder look to see if I was looking and another wag. I quietly closed the door, usually a cue for him to dart out of the room, but he just stood there wagging at me. Now LB loves chasing stones in the ford and over the summer he’s been playing in a paddling pool my mum found for him. He’s so obsessed with the stones I’ve got a handful in a jug in the bathroom in an attempt to make the dreaded bath time more bearable. I picked up the jug and before I could do anything he had jumped into the bath! What’s more he was wagging fit to bust! Needless to say he got his bath but not until we’d played stones for a long time – it seemed only fair after he’d asked so nicely! Yesterday reminded me of an incredibly valuable lesson: never underestimate the power of a positive reinforcer – they work, but they’re often not the things we think they are.